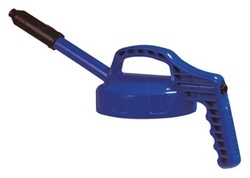 100302 Stretch Spout Lid - OIL SAFE - Blue. The Oil Safe Stretch Spout lid is designed for use where precise pouring of lubricants is required including hard to reach areas. Ideal for lower viscosity oils (Less than ISO 220). Copyright © Blastline Industries. All Rights Reserved.